Thomasin Gulgec was born in Oxford and trained at the Rambert School. He worked with Rambert Dance Company between 2003 and 2014, and danced many works in the repertoire, having roles created on him by Fin Walker (“Reflection”), Javier De Frutos (“Elsa Canasta”) and Darshan Singh Bhuller (“Stand and Stare”). He is nominated for his role in Christopher Bruce’s “Hush”. 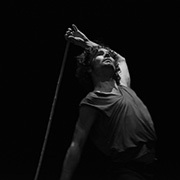 Recent works include his collaboration with Estela Merlos to choreograph and perform in “The Reservoir” at Wilton’s Music Hall in May 2016 and performing in Julie at The National Theatre, 2018.